I like to draw in my spare time, and one thing I like to draw is ideas for characters to use in games or stories. I have a few today that I wanted to share out with you all. This fella came from a game/comic/whatever idea with the working title of "Other Side". Originally conceived by my good friend Braeden, it's about magical civilizations that live on the inward curvature of the earth. Their land is only accessible through portals that open from the Earth's outer surface, and in addition to housing migrants from the early history of humankind, also contains civilizations that were made to suddenly disappear from the Earth's surface (such as Atlantis) due to portals being created to envelop them. Flying is an important mechanic in this world (since it allows you to bypass great amounts of land), and the main character has a steed called a DragonBat. I normally draw dragons in a more serpentine fashion, with obvious scales and snouts and a generally more terrifying demeanor, but with this creature (which also transforms into a smaller, much more batlike form when not being ridden or attacking), I knew I needed something more docile with a rounder, more determined personality. 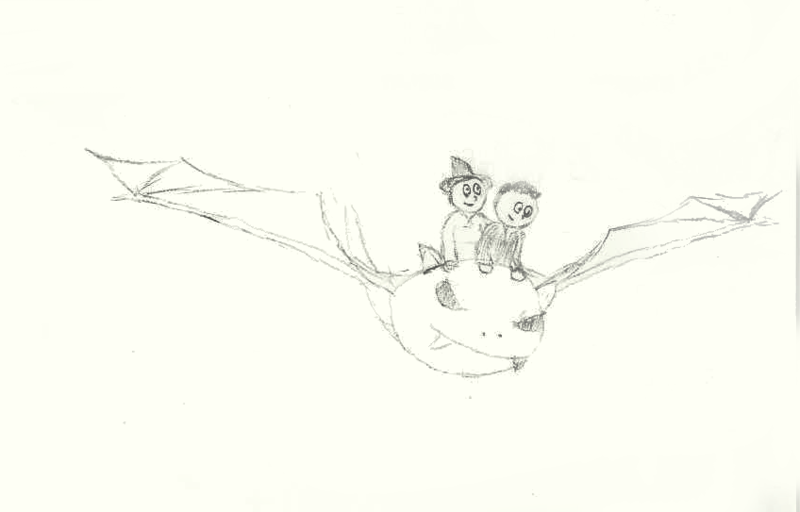 I took a lot of inspiration from Toothless in Dreamworks's How to Train Your Dragon. The riders are also departures from my usual character style. My human characters normally have simple dots for eyes, but I found that these more open eyes were more important for these characters' expressions, especially alongside the DragonBat's big, dark eyes. I was originally attempting to draw Gil with his girlfriend (as matches the story idea), but the female character ended up looking more middle aged, so I decided that that would be his mom. Which does still work - perhaps it opens up an idea for a Zelda-like sequel with different characters that share the same names and fashion choices. This guy was originally conceived when I was thinking of an idea for a dungeon-crawler-themed card game. Thinking of various epic monsters that the players would have to defeat, I eventually happened upon this idea that just seemed so awesome that I knew I had to use it for more things. I mean, heck, it's a snake in a pinstripe suit. You could do a lot with that. I kinda imagine him as a crime boss character, someone who stands out as ruthless, yet very intelligent and well respected. He would certainly be the villain of his own game, but I also imagine that he might turn up in other places, like at fancy dinner parties or walking down the street or chattin' it up with some good guys on a restaurant patio - certainly not obviously or even fully evil. 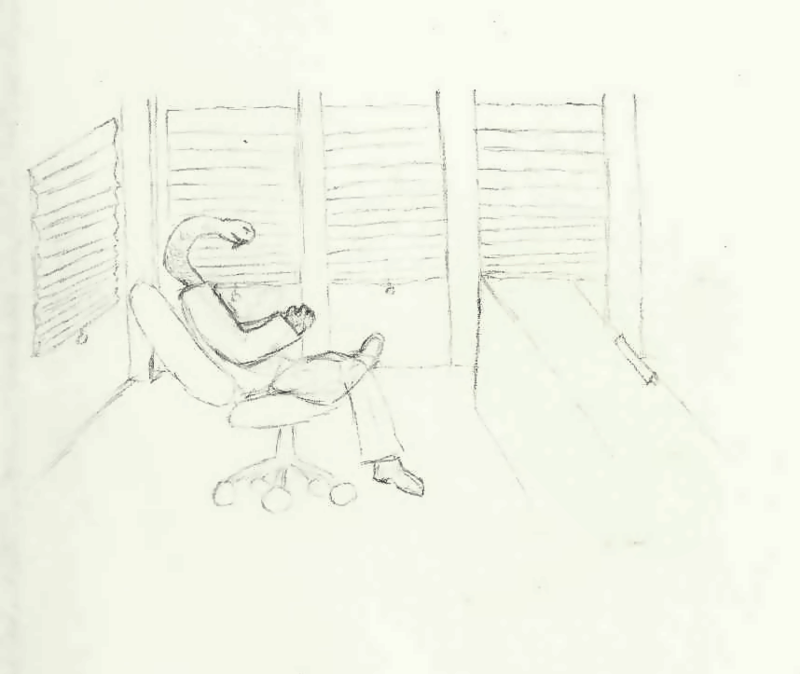 He might even be leaning by a door on my Scripts and Such page, I don't know. This guy doesn't even really have an origin story. 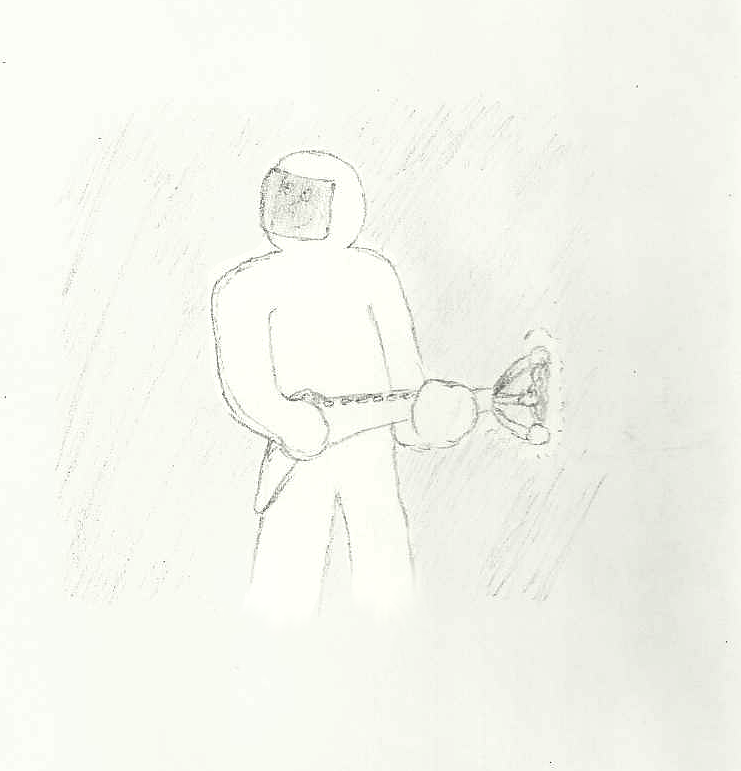 I was thinking one day about a concept of using an arc of lightning to swing from place to place, and of course I needed a guy in a insulating suit for that. So I drew a quick picture one day of this concept, and then had the thought of putting a face in the visor, which I think really changed the character of what I saw. This is another illustration of that character in a more neutral pose, which is where I got the idea of calling him the Thunder Soldier. I wonder if I can do more with this guy.